Home » Tea & Coffee Makers » What is the Best Drip Coffee Maker for the Home? Great coffee depends a lot on the quality and grind of the beans but it also depends a lot on the method you use for extraction. The manual method of pour-over is best, but for regular coffee drinkers this requires a lot of time and patience. That’s why the best automatic drip coffee makers provide convenience for home coffee drinkers without sacrificing taste. Want to know what is the best drip coffee maker for the home is? You should first know what features of the machine play an important part in the brewing process. The water temperature and quantity is important and so is brewing time. If you use fully automatic drip brewers, you must ensure that these settings are perfect right off the bat. Many connoisseurs prefer to have more control over some of these settings so that they can make adjustments whenever they change coffee beans, roasts or coarseness of the ground beans. The best coffee comes from beans that have been freshly ground, so you can either grind them yourself using a separate coffee grinder or buy a bean-to-brew machine for the ultimate hands-off approach. The other factors to look out for are overall quality of the machine, type of filter and carafe. A filter can be flat bottomed or conical, with the former usually being better for even extraction. A carafe can be glass with heating plate or a thermal one, with the latter being better as continuing to warm brewed coffee causes flavor to deteriorate. We will look at how to brew perfect coffee at home in depth in another article, but for now we’ll show you the best rated drip coffee makers that consistently perform well. For the days when you have a bit more time, don’t hesitate to try manual pour overs for unmatched coffee taste or even this very popular Presto coffee maker that works in the old percolator way. Note: In 2013, Cook’s Illustrated America’s Test Kitchen performed a test of several models and picked the winner and runner-up, both of which we include in our list here of automatic drip coffee maker reviews. However, several brands that they dismissed then have upped their game to address issues with their earlier models. Some of those new models perform very well now and are more wallet-friendly, so we’re including them here. The Specialty Coffee Association of America conducts a quarterly brewer testing cycle that accepts models for testing according to very strict standards that might not be ideal for some coffee drinkers. They update their recommendations based on the results of those tests and all those models can be found on Amazon.com. Their most recent certification went to the OXO On 9 cup and 12 cup coffee makers and you can see our review of the OXO On 9 cup model here. Some of the following home coffee makers are very quick at their job and are also rated as the fastest brewers on the market. These two Moccamasters are identical except that the KBGT model has an auto drip-stop feature with full carafe brewing, while the KBT model is a manual drip-stop that gives you a choice between half and full carafe. The automatic allows you to remove the carafe and pour an individual cup without you having to do anything, otherwise you’ll have to remember to manually turn off the machine to pour an individual cup. The auto and manual give you a full carafe in 6 minutes, while the manual also makes the half carafe in 4 minutes. You’ll pay a few extra bucks for the automatic feature, so you have to decide which feature is more important to you. That it makes great coffee can’t be argued, possibly the best coffee ever. It doesn’t come with a filter, so you’ll need to supply your own paper types or get a permanent gold type. Using a pulse action during extraction helps coffee grounds release maximum flavor and this is done at the ideal 196-205°F temperature range. To keep the coffee hot in the carafe, it will need to be pre-heated by first pouring hot water inside. This is, perhaps, the best thermal carafe coffee maker available. Granted, you pay a pretty penny for each of these units, but if you want the best coffee imaginable, you won’t be disappointed. While a few users say that this machine is prone to clogging up, the instructions manual explains how you have to maintain it to prevent this from happening. Another one of the best rated coffee makers with thermal carafe is the Bonavita BV1900TS, which is a step up from the older 1800TH model. The carafe is made of stainless steel and doesn’t keep the coffee hot for very long and the last bit of coffee left in the thermos is difficult to pour out. That also goes for the water when it is washed. However, it makes great coffee and is virtually unbreakable, so that’s the trade-off. This machine is rated as an 8 cup coffee maker, but it bases that assumption on the fact that each cup of coffee is only 5 ounces. If most of you think that a cup of coffee should be 8 ounces, then you’ll only get 5 cups per brewing cycle. Of course, we are talking about one of the best coffee makers available and these slight distractions may not mean much considering the taste of the coffee you’ll get. To that end, the pre-infuser feature pre-soaks the grounds to remove the gas, which makes for a richer cup of coffee no matter what grade of coffee you use. It brews consistently between 196 and 205°F and turns itself off once the cycle is complete. Although pricey, it is about half the price of the Moccamaster twins listed above, and unless you are a true coffee connoisseur, you probably won’t know the difference. This does have the best thermal carafe of the bunch. Your coffee will stay genuinely hot for up to 5 hours, and no other thermal carafe on this list can say that. In fact, users rave about the design of the locking lid and no spill pouring or filling design. It brews at a guaranteed temperature of above 200°F, which helps the final extracted brew stay warm for longer. 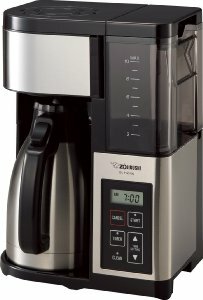 That the Zojirushi Fresh Brew Plus makes great coffee can’t be argued and it is one of the easier units to use. The water reservoir is removable so you can fill it at the sink. This unit uses flat bottomed paper or permanent filters that are easy to insert. Once done brewing, you can use the automated clean cycle. The only real “con” about this product is that it does not have an auto shut off feature. You’ll have to wait until the cycle is finished before pouring a cup, or, you’ll have to switch the unit off in mid-stream. But for the price, you’ll be getting a superb coffee maker, bar none. If you don’t like thermal carafes, but still want a superior cup of coffee, the Bunn BXB Velocity Brew won’t disappoint. It is exceptionally quick, and will brew a full 10 cup pot in as little as 3 minutes but you can also set it to brew as low as 4 cups. As with many units, Bunn rates their coffee cup size at 5 ounces, so although rated at 10 cups of coffee, if a standard size cup for you is 8 ounces, you are only getting about 6 cups worth. The heating plate beneath the pot is porcelain coated which distributes the heat evenly throughout the glass pot to minimize the risk of having a burnt coffee taste. It also has a very precise temperature control at 200F. There is no auto-stop feature, so you’ll have to wait until the brewing cycle is complete before pouring coffee, but since it only takes 3 minutes full cycle, that may not matter. It works best making a full pot of coffee on each round and because it “jets” the water onto the coffee for full coverage of the grounds, and thereby a better cup of coffee, it is a bit loud during this process. But really, these are just minor points for a glass carafe unit that brews wonderfully good coffee. If versatility is the name of your coffee game, you can choose to brew as little or as much coffee as you want. The Cuisinart DCC-3200 Perfect Temp is completely programmable, with a pre-programmed 1 to 14 cup brewing cycle, or you can manually program in as many cups of coffee that you desire. You can also choose to brew regular or bold strength coffee and it takes up to 11 minutes to brew depending on your program settings. The auto-stop feature lets you pour a cup of coffee before the pot is filled, the auto-shut off warming plate stays on for 4 hours, and there is an auto-clean function. The lighted LED panel is easily visible, and the front control buttons are simple to access. This is the tallest glass carafe coffee maker here, so if you have lower cabinets, it may not fit beneath them. It comes with a permanent gold tone filter. This may not be the best coffee maker on this list, but it comes close. It is easily programmable and the auto stop-drip means you can get a cup of joe at any time you want one. If you and the members of your family like to have coffee at any given moment during the day and don’t want to use a carafe, the Cuisinart DCC-3000 can brew and hold up to 12 5oz cups at a time and you can make it dispense just one cup at a time via a lever. Of course, you can have more than just 5 oz in one cup or you can place a travel mug underneath too if you remove the drip tray. You can also set it to make just one to four cups at a time so as not to waste your precious coffee. The coffee reservoir is double-walled to keep the brew hot for a long time and it is removable for easy cleaning, as is the water reservoir. The water reservoir can be filled at the sink before fitting it back in place in the machine. Before closing the lid, you have to fit in the included charcoal water filter that removes impurities and keeps your coffee tasting great. This unit comes with a permanent flat bottomed gold toned filter that will hold your pre-measured coffee grounds but you can also use paper filters. You can either set it to turn on immediately or program it for later brewing. The auto on and off feature makes this easy to do. It also comes with cleaning and descaling functions. A coffee gauge on the front of the machine lets you know how much coffee is left in the coffee tank inside. What is great about this machine is that it is one of the few machines at this price level that brews your coffee within the ideal temperature range. Make sure you have enough counter space, though. This unit is not small and the power cord is a bit short! If you are looking for a coffee maker with removable water tank, and maybe a unit that gives you the best bang for the buck, this Hamilton Beach Brewstation won’t let you down. Best of all it is the best cheap drip coffee maker to buy. First of all, there is no carafe. It brews and then holds the coffee inside but ready to be dispensed, much like a professional machine. You can dispense virtually any sized cup you want, and you can use a cup, a mug or even a personal thermos bottle. The water reservoir, which doubles as the coffee holder, pulls out, so you fill it at the sink and then use it as the pitcher to fill the unit. It is perfectly programmable, so you can make as many or as little amounts of coffee as needed. Because there is no hot plate, your coffee always remains at the perfect temp inside. Since this is a pressurized dispensing coffee maker, the last cup in the unit may not come out as fast due to the inevitable loss of overall pressure.